Terracotta is a natural product, so you can expect it will have colour tone variation, minor structural deficiencies such as pitting, and other marks all of which make each terracotta floor unique. Terracotta will arrive in its natural form, which can be much paler than the sealed finish, this is due to the sealing process. There are other ways in which you can seal terracotta please visit LTP to see other options, this guide covers the traditional way of sealing terracotta. The process of laying terracotta begins with spreading out your adhesive on your primed concrete or timber floor using a notched trowel, make sure to spread out the adhesive evenly and at the same thickness. Always work in manageable areas. Then lay the terracotta into the adhesive, be careful not to get any adhesive on the top surface of the terracotta. Allow for a 5-10mm grout joint. Leave the adhesive to set as per the manufactures instructions. Once the adhesive has set, apply one even coat of LTP Boiled Linseed Oil and leave for at least 4 hours before applying the second coat. (remove any excess that is on the tile after 1 hour). Apply Boiled Linseed Oil until the terracotta is fully saturated. Allow 24 hours for the final coat to cure. Once the final coat has hardened apply a coat of LTP Antique Wax, leave for 20-30 minutes and the buff to a shine with a stiff brush or buffing machine. After the wax has be buffed apply the grout in with a grout float, leave for the recommended time and sponge off the residues. Once dry, dust of any remaining residues and then apply another coat of LTP Antique wax and leave to dry overnight. For additional protection and to give the terracotta a shine, apply 2-3 coats of LTP Ironwax Gloss. For more information please follow our video guide. Kitchen, conservatory or living room; terracotta once fully sealed is suitable for most areas in the house. With the added benefit that terracotta retains heat better than any other tile, the floor should never feel ice-cold to the touch. If used with underfloor heating these tiles will retain the heat even when the heating has been turned off. Teatree terracotta tiles are handmade and therefore no two tiles are alike, they will have all the characteristics of a natural product; colour tone variation, minor structural deficiencies such as pitting, and other marks all of which make each terracotta floor unique. The terracotta will come in its natural form, and so before sealing the tiles it is advisable to rub them down with an cloth to clear them of dust and any possible chipped edges. Seal with LTP Boiled Linseed Oil, not only does this intensify the colour, but as the Boiled Linseed Oil cures it hardens within the pores of the terracotta giving the floor extra mechanical strength. Finally apply two coats of LTP Antique Wax, this aids in protecting the surface of the terracotta as well as giving the terracotta and grout a little more depth and colour. The first coat should be applied before grouting to aid grout removal, and then a final coat after the grout has dried. This then protects the grout from staining. If you require a more uniform terracotta you can opt for the Jose sempre machine-made terracotta. These tiles have straight edges and each tile is very similar in size shape and thickness, so they will look very different from their handmade counter parts. Furthermore, rather than using boiled linseed oil, you can seal them with LTP Mattstone to keep the terracotta looking as close to its natural form as possible whilst also protecting the terracotta from staining. The Handmade teatree tiles have been sealed with 3-4 coats of LTP Boiled Linseed Oil and 2 coats of LTP Antique Wax. Once tiles have been layed in to a full bed of adhesive but before they have been grouted they will need a generous coat of LTP Boiled Linseed Oil applied with a paint brush. The Oil is designed to soak into the tile and fill the pores from within, the oil then hardens within the pores. Remove any excess that remains on the surface of the tile after 30 mins, and leave for 8-12 hours and then repeat. 200×200 terracotta should need approx 2-3 coats. 340×340 terracotta should need approx 3-4 coats. After the final coat of linseed oil leave for 24 hours before waxing. NB: Used Boiled Linseed Oil cloths can be a fire risk, dispose of any soiled cloths as per instructions on bottle. Apply as generous coat of LTP Antique Wax with a micro fibre cloth and leave for 15 minutes , then buff well using a soft brush or buffing machine. Leave for one hour before grouting. When the grouting has fully dried, apply a final coat of antique wax over the tile and the grout joints, rub in with a fluff-free cloth and buff. Protect from water for 24 hours and do not wash surfaces for at least three days. Finally, to ensure you get the best from your terracotta floor, use LTP waxwash aftercare for routine maintenance, this not only cleans the floor, but protects the sealer at the same time. Terracotta is a traditional, authentic flooring tiles that possess a warmth, a charm and a character, often missing from more contemporary factory produced alternatives . Spain and Mexico tend to be the main sources of terracotta floor tiles sold in the UK, however it is possible to buy terracotta from a range of other countries such as China, Vietman, Iran and India. 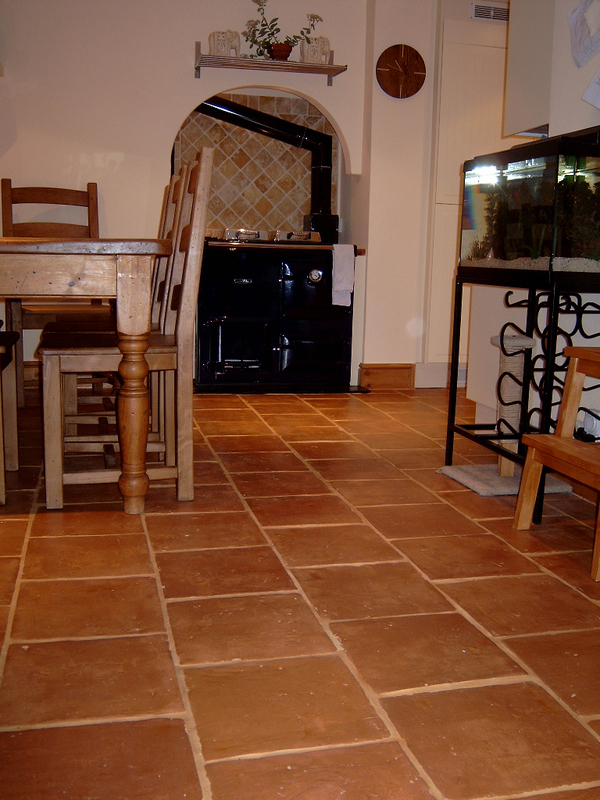 Terracotta tiles as a flooring was a popular choice in the 1980’s and 1990’s in the UK as the unsophisticated warm finish it offered complemented the design requirements of the time which tended to focus on rustic, farmhouse/cottage style kitchens and barn conversions. Since then the fashion and demand for natural tiles has shifted towards stone and travertine, however the demand for terracotta floor tiles still remains solid in more rural locations especially for barn conversions. Terracotta tiles fall into one of two categories: Machine made terracotta tiles and Handmade terracotta tiles. Our Jose Sempre range of Machine Made terracotta tile tends to be a more highly fired, disciplined, more vitrified tile similar to a quarry tiles, yet still possessing warmth and charm. A mellow sandy coloured terracotta tile, the tones varying from pale seinna to burnt amber. The smooth and manicured look fits well in any location and works well in contemporary settings. Our range of Handmade or semi hand-made terracotta tiles are much more varied and rustic in appearance and are formed by pressing raw clay into molds: this produces a durable but low density tile. Handmade terracotta tiles act as excellent insulators underfoot and are especially suitable for use in conjunction with underfloor heating systems. Hand-made terracotta tends to be either a honey/beige in colour or a rich leather red colour. 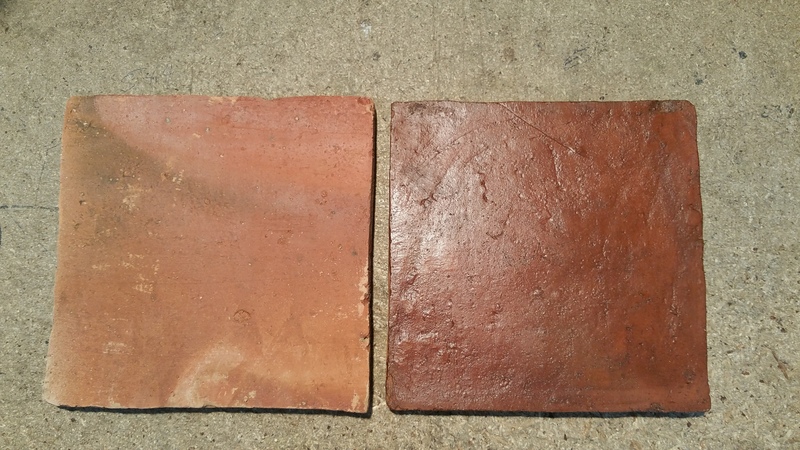 In addition some tiles can be almost salmon pink in appearance.This terracotta tile shows all the characteristics associated with a handmade terracotta tile: attractive colour, tone variation, minor structural deficiencies such as pitting, nooks and crannies on the surface and edges of the tile. Do I Have to Seal Terracotta (Terra cotta) Tiles? As with all natural tiles and grouting, sealing and maintenance is very important. In order to get the best out of your terracotta floor tiles it is vital to consider the sealing options and then to follow the prescribed maintenance regime as this will not only ensure that the natural character of the floor is fully enhanced, but also with correct maintenance the floor will continue to look at its best for many years.